Combining geopolitics with world history, a droll examination of flags and their symbols—how their power is used to unite and divide populations and intimidate enemies. [Marshall] writes with the cool drollery that characterized the work of Christopher Hitchens or Simon Winchester. He tackles a topic that many people take seriously without taking himself seriously, and the result is a book that explains where many of the flags that capture the world's imagination come from and why ... A Flag Worth Dying For is a fresh explanation of symbols we often take for granted, and a keen meditation on what flags mean to those who embrace or recoil from them. It's not a book worth dying for, but it's one worth reading. There is something a little dutiful about this tour, but Marshall offers us a surprising fact or six along the way ... Marshall oscillates between telling the story of the way flags unite us and the way they divide us. He is acutely aware that they often do both at the same time, and it is this tension that brings out his most illuminating writing ... Marshall is especially good on how flags encode the history of the violence that brought the nations they represent into being and how quickly they can become emblems of racial and ethnic bigotry ... The writing in books like this is often rushed and cramped on the one hand and glib and expansive on the other, and Marshall does not transcend the genre. The supposedly clever bits can be particularly annoying ... Readers looking for an understanding of how silk waving from a stick can come to mean everything will be disappointed, but they will not leave empty-handed either. ...[an] amusing but ultimately frustrating book ... The book is essentially a compilation of such facts about flags, and the author is clearly uninterested in exploring the broader significance of the multitude of individual facts with which he packs each of the nine chapters. Marshall writes more as a hobbyist who hoards details about the subject of his fascination rather than as an analyst attempting to explain the role of flags in international affairs or domestic politics ... We surely need a deeper understanding of the dynamics of nationalism and the powerful appeal of political symbols. 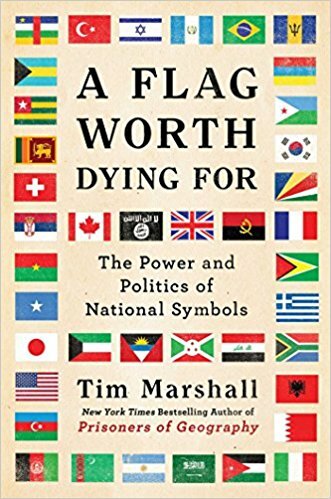 Marshall acknowledges as much but ultimately does little to use his vast knowledge of flags and the lessons of history to offer robust insights about the uses and misuses of flags in world affairs. What did you think of A Flag Worth Dying For: The Power and Politics of National Symbols?